If Godzilla Loses We Riot! Image credit to LDN-RDNT of DeviantArt. It’s happening! Godzilla vs Kong is a reality! There are so many questions on how this is going to work. The biggest issue is obviously the size difference. I’m guessing either Skull Island or Godzilla 2 (really hoping they come up with a better name) will somehow increase Kong’s size, or else this is going to be an extremely short fight. 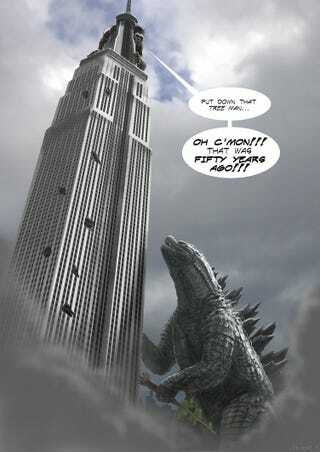 What will bring these two classic and famous kaiju to blows? Will Legendary go with the same reasoning the 1950s Godzilla vs King Kong used to justify their clash ( they were simply drawn to each other)? Will a new threat force the two into confrontation? Is this somehow humanity’s fault? But the most important question of all: Will Big G get pay back for the tree incident? I really hope so. No matter what, if Kong wins I will riot!